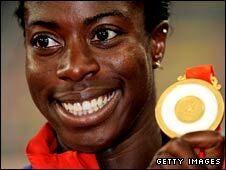 Britain's Christine Ohuruogu insisted nothing could spoil her moment of glory after winning the Olympic 400m title. Ohuruogu won the 2007 world title after returning from a ban for missing three drug tests, and reacted tetchily to questions on the subject in Beijing. "Why should it be spoilt unless someone tries to spoil it?" she told her post-race news conference. "I'm very happy with what I've done - three medals from three major championships so nothing can spoil it." Asked what she had to say to people who thought she should not be at the Olympics, she replied: "I don't care what people think or say. I'm happy - I've won a gold medal, and that's all that matters to me." 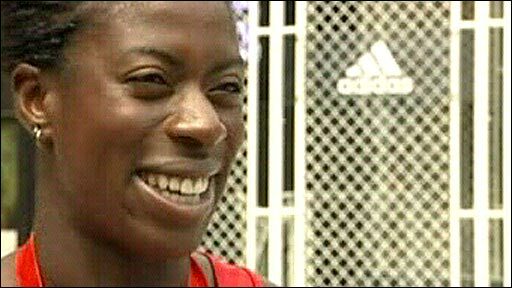 Ohuruogu, who is the first British woman to win the Olympic 400m title, was born and brought up in east London and is now set to be one of the faces of the 2012 Games. But she was clearly frustrated that in her moment of triumph she was not given the credit she felt she deserved for bringing a much-needed gold to Britain's beleaguered track and field team, and beating pre-race favourite Sanya Richards. Flanked by a glum-faced Richards, who finished third, and bubbly Jamaican Shericka Williams, delighted with another track medal for the small island country, Ohuruogu stuck her chin out and batted back leading questions with barely-contained irritation. "Sorry, but I don't know what you mean by 'not having ideal preparation'," she said in frustration to the first interviewer. Asked whether she had had nightmares about not reaching the start line, she took an impatient breath before replying starkly: "No, I did not." As the atmosphere in the newsroom prickled, Ohuruogu tried to put the focus back on all the hard work she had put in over the last 12 months. "I'm very proud that we have a gold medal in athletics, proud of myself. I've kept my head up and kept working." Earlier she had told reporters: "It's not luck, I worked damn hard for this. "The final is about who has the biggest will to get to the line. That's life, you have to learn to ride the ups as well as the downs." 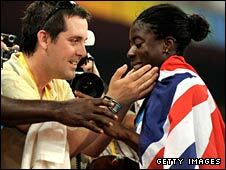 After winning a Commonwealth gold in 2006, Ohuruogu had been barred on a provisional basis by UK Athletics for failing to attend three dope tests across an 18-month period. Ohuruogu said changes to her training timetable had forced her to miss the tests. But in September 2006 it was confirmed that she would be banned from competing for 12 months - and faced a lifetime ban from the Olympics under British Olympic Association rules. After the ban expired in August 2007, she was included in the GB squad for the World Championships in Osaka and won the 400m despite the 12-month break. She then went on to win an appeal to the BOA against her Olympics ban and was therefore allowed to compete in Beijing. Ohuruogu admitted it had been "quite a journey getting here", and her delight showed as she jumped up and down on the medal podium. "It was really hard getting here; I'm happy I stuck to my guns and believed in myself. "I'd have never forgiven myself if I had not kept on working." Asked if she expected to win gold, she said: "Yes I did. Winning the World Championships is not luck, it's down to my hard work. "That's all I train for throughout the year. I hope it is something other athletes can learn from. "I'm always a positive person, no matter what, things will always turn out for the best. I believe I'm destined for great things and that's what keeps me going. I just get my head down and work." The 24-year-old first took up the 400m event at Newham and Essex Beagles Athletic Club, which also produced double gold-winning decathlete Daley Thompson, in August 2000. Bob Smith, the club's chairman, said: "She's level-headed and surrounded by good people - she will keep her feet on the ground. "She has had her trials and tribulations and she knows how to treat it." The 24-year-old, from Stratford in east London where the 2012 Olympic Park is being built, says she is now excited at the prospect of competing "on her doorstep" in front of her home crowd. "It is a long way away - it's four years. But it (Stratford) is literally on my doorstep and 15 minutes away from where my parents live and where I was brought up and lived all my life, so yes it would be great if I got there," said Ohuruogu. "That would be quite something to come out on the track and compete in front of my home fans....Cathy Freeman all over again!" added Ohuruogu, referring to the Australian icon who produced one of the great Olympic moments when winning the 400m title in Sydney in 2000.